The addition of the Increase and Decrease buttons for the main controls, such as timebase, is a great time-saver for both mouse and touchscreen users. Just tap once to change range. With this feature, you can change from 10 ms/div to 20 ms/div with only one click of the mouse or a single tap on the touchscreen. The Increase and Decrease buttons are ideal if you just want to move up or down to the next range on the menu. 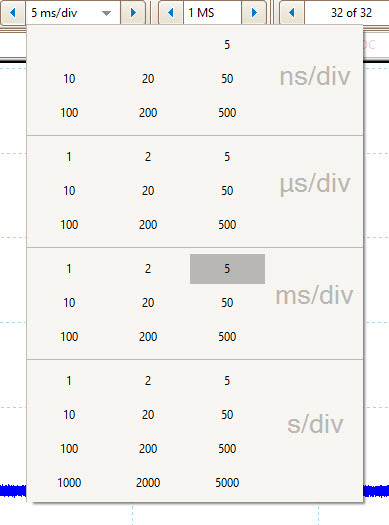 If, however, you want to jump to a specific timebase or voltage range, the value grids make this faster and easier than the previous drop-down lists. 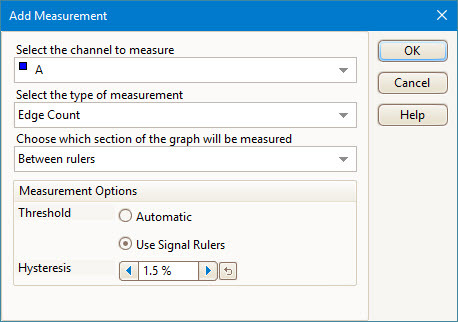 The addition of edge count measurements stems from a frequent customer request for the software to automatically count the number of edges in a waveform. 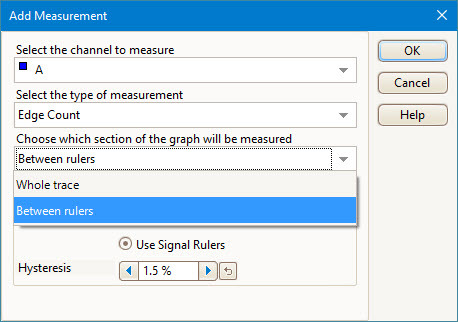 With the new edge count measurement you can choose between rising, falling or both edges. Measurements can be made on all data or just between rulers. The Serial decoding feature has an improved user interface.